One of the boons of the internet is that it has encouraged creativity. Some of that might be misplaced but there is some great content out there in the form of films, music and writing, which can find an audience thanks to the net. Web-serials are just such a thing and in this case we have one that owes a lot to Buffy the Vampire Slayer not in content as such (though it does follow a group of female slayers, though their ‘Scooby Gang’ is noticeable for its dysfunction) but in sass and meta. It is this meta that allows the serial to work as they can throw in story arcs, mid-arc as it were, and the meta allows a viewer to follow it. It does this with aplomb. 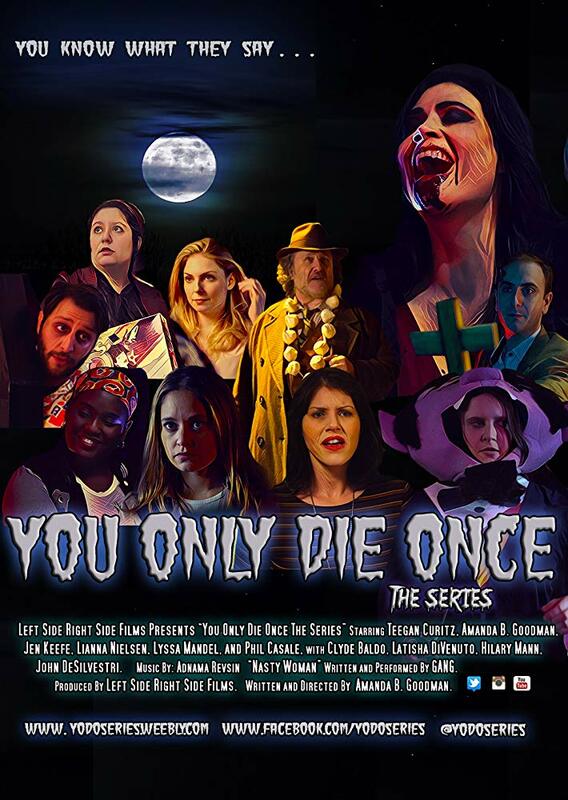 So the series follow three vampire slayers; Cecelia (Amanda Goodman), Linda (Teegan Leah Curitz) and Jamie (Jen Keefe) who live in Queens and we start in the middle of a fight against a metal vampire (Marc Goodman). The fight is marked by a lack of actual fighting and a lot of in-group bitching, but the job is eventually done and the vampire explodes (off screen) covering Cecelia in blood. Going afterwards to an apartment owned by Ann (Lyssa Mandel) who is in a relationship with Linda’s adopted brother, and now vampire, Rufus (Philip Casale) – a good vampire. As the series of 6 episodes (varying between 6 and 15 minutes long) goes on we get a variety of arcs touched upon but the main one is the return of Joseph ( Clyde Baldo), a hat fetishist and friend of Cecelia’s dead vampire slayer uncle with news of who killed him – pointing the finger at Viera (Lianna Nielsen), the vampire who turned Rufus. This sends the girls on a mission of vengeance. I don’t want to spoil any more but I must mention the costume party attended in one episode and how Linda’s costume was reminiscent of Buffy in the Prophecy Girl episode, how Rufus dressed as a low rent David from the Lost Boys, but mostly I just want to enthuse about Jamie’s Count von Count costume (there were, of course, many other mods to over vehicles). Brilliant stuff. Its great to find a fun web serial and I think this deserves a creditable 7 out of 10. You can watch the series at Seeka.tv. The imdb page is here.